Here are descriptions of all Kenyan cities and towns that have over 100,000 inhabitants. Totally they number 11. Most of them underwent massive growth during the last 10 years. The figures quoted are 2005 estimates collected by Mongabay.com. However, there are several estimates and they vary widely. The official Kenyan Bureau of Statistics (KBS) has only published figures from 1999 on it’s website. 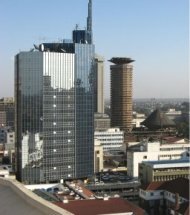 Nairobi is the capital of Kenya, and the country's largest city. It has all the modern amenities of a major city anywhere else in the world. Nairobi is home to universities, local television stations, and the Internet is easy to access throughout the city. In 2005, the population of Nairobi was estimated at nearly 3 million people and the city covered an area of 684 square kilometers. However, the actual number of people may be higher. The city is in the Central province, located in the south-central part of Kenya. Jomo Kenyatta International Airport is located in the city, and is a major travel hub for the country. And true to the nature of Kenya, there is a wildlife preserve right on the border of the city, the Nairobi National Park. On the south-eastern coast of Kenya, is the city of Mombasa. The city proper is actually located off the coast, on Mombasa Island. It's connected to the mainland via ferry service and bridges. Many parts of the city and outskirts are on the mainland. A large number of coastal resorts makes Mombasa very popular with tourists. 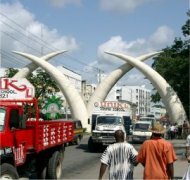 Mombasa is considerably smaller than Nairobi, and yet still the second largest Kenyan city. As a coastal city, much of the industry is driven by trade. There is an international airport in Mombasa, and there are major highways connecting the city with the capital. Kisumu is the third largest Kenyan city, with a population of over 350,000 (in 1999). It is a port town, but sitting on the shore of Lake Victoria rather than the Indian Ocean. There are several animal sanctuaries in Kisumu, as well as a large museum that contains a full-size replica of a Luo homestead. Ferry service across the lake connects Kisumu with Tanzania and Uganda. Barack Obama Sr., father of the 44th US President Barack Obama, is from the Kisumu area. Nakuru is the provincial capital of the Rift Valley Province, and has a population of roughly 300,000 people. It was founded during the British colonial period as white ranchers moved into the highlands. Today, the city is a modern and cosmopolitan one, with several large universities, commercial centers and a major agricultural sector. Only a few kilometers from the city, lies the important archaeological site at Hyrax Hill and the Lake Nakuru National Park. Located at the western edge of the Rift Valley province, Eldoret is one of the fastest growing Kenyan cities. According to the 1999 census, the population was almost 200,000. Moi University and Eldoret International Airport are found here, as well as a teaching hospital. Agriculture is still an important source of income for the town. Kenya's second president, Daniel arap Moi was born nearby to Eldoret. This is actually a kind of suburb of Nairobi, located only 3 kilometers outside the city. Many people have recently moved from Nairobi to Ruiru because of lack of housing in Nairobi. This led to a huge growth of the town: from some 100,000 in 1999 to over 225,000 in 2005. The town is surrounded by many coffee plantations. The Kenyan city of Machakos was the original government center when Kenya was still a British colony. The capital was relocated to Nairobi in order to be closer to the Uganda railway. Machakos has a population around 140,000, and many are from the Akamba tribe. It is only 64 kilometers from Nairobi, which has spurred its rapid growth. Peace talks aimed at ending a Sudanese civil war took place here, which led to the Machakos Protocol in 2002. An important town in the coffee-growing area, Meru sits on the northern slopes of Mount Kenya. It is an agricultural town, with crops such as coffee and tea being of foremost importance. Many farmers have turned to growing Khat, a leafy plant that is chewed as a drug and illegal in many countries. There are several wildlife parks in the area, so Meru has become a stopping place for adventure tourists. Nyeri is located 150 kilometers north of Nairobi. The town lives first and foremost of tourism and farming. Sources vary widely on the population number, but it’s clear that it's one of fastest growing Kenyan cities. Many famous Kenyans originated from Nyeri, such as current president Mwai Kibaki and Nobel Peace Prize winner Wangari Maathai. Kitale lies in the far west of Kenya, close to the Ugandan border. It’s also close to the delicious little Saiwa Swamp National Park. The town was founded in 1908 by European settlers. It’s mainly an agricultural town: sunflower, coffee and tea are grown here, and there’s an important market for agricultural products. Kericho is in the south-west of Kenya. This town is inhabited by the Kipsigis tribe, a sub tribe of the Kalenjin. People of this tribe are among the world’s most successful long distance runners. The Kipsigis are known to hold on to their cultural values. Most of them are Christians. The area is one of the biggest tea producing regions in Kenya; the country is the fourth biggest tea producer in the world.